Sadly due to a whole raft of events too boring for Herodotus to have bothered chronicling, I am selling off my armies. Quite a lot of the lads have already shipped out, but several thousand still remain here at HQ - Greeks, Macedonians, Celts, Persians, Indians and Carthaginians. I'm selling them at 75p for foot, £1.50 cavalry, £8 for chariots/elephants and will offer discounts for bulk purchases. If you're interested get in touch with me via the blog and I'll send a list. Thanks for your company over the years. I've enjoyed it. 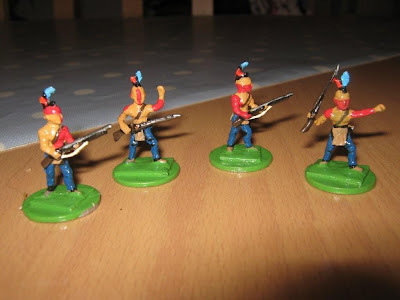 I'll leave the blog up here for reference and - to end on a positive note - I'm pleased to say that very soon the original vintage wargame figure site, Vintage20Mil should be up and running again thanks to a nice chap in Texas. I'm not quite sure how it's happened but I seem to have ended up with dozens of Minifigs Pb range Palmyran archers. I have a feeling I may use them as late Roman auxiliaries, probably to take on a ravening horde of Picts and blue Hurons in some sort of 4th Century Northumbrian skirmish-ish scenario. These javelin men are the PB125 Roman Light Infantry of the later 2nd, 3rd and early 4th centuries. They are Palmyran in style. A Palmyran archer converted into a standard bearer. I've got a few Palmyran cataphracts somewhere too, though sadly the Palmyran camelman figure has thus far eluded my clutches. I wonder if any wargamers ever actually deployed a Palmyran Army? A game against Mark Antony's forces would be colourful. *Anita Ekberg was cast as Queen Zenobia of Palmyra in late fifties Italian epic Nel Segno Di Roma. 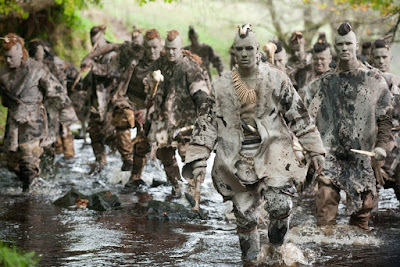 For those of you not familiar with The Eagle these are The Seal People. Now the figureheads have fell? You're probably wondering what the splendid, if semi-literate lyrics of New Romantic yacht-sailing fops Duran Duran and a load of S Range Woodland Indians have to do with Ancient Wargaming. 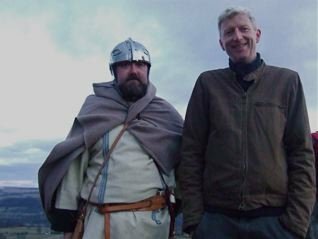 The rather eliptical answer is to be found in the film The Eagle (which I watched again last night - and damned wonderful it is too, from the scythed chariot of the wild-eyed druid to English actor Mark Strong's excellent decsion to affect a New York accent to play a Celtic Roman legionary). 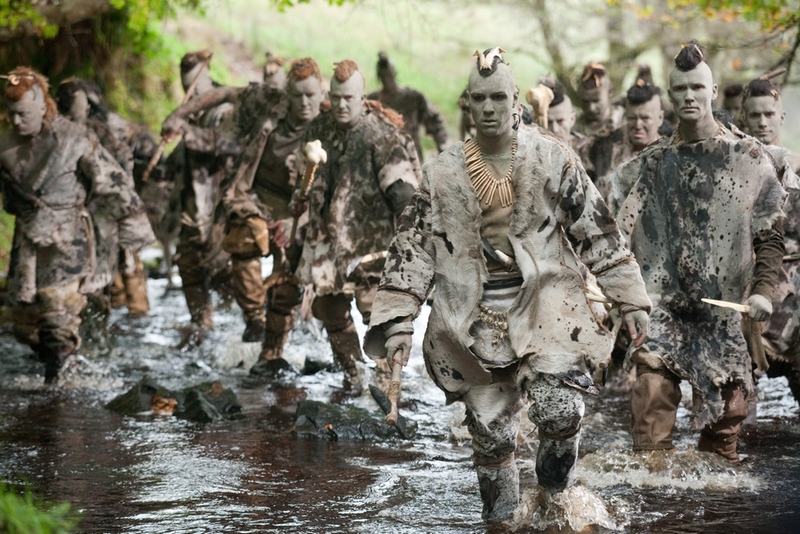 Leaving aside the Vivienne Westwood/ Irvine Welsh touches, the other thing that is plain to see is that The Seal People owe quite a debt to the Iroquois and other North American Woodland Indians. The figures above might easily be converted into Seal People. And don't think I'm not tempted. Searching through a box of figures yesterday I came across this little chap - an S range mounted gladiator by the look of him. I've stuck him on one of the PB range late Roman horses I had lying around. Maybe it's just me, but there's something about the gladiators helmet and mask that always puts me in mind of those novelty salt-and-pepper cruets in the shape of men in bowler hats. Be that as it may, or may not, I've just aquired a copy of the Italian gladiator boardgame/figure game hybrid Gladiatori. When I've figured out the rules I will give it a try with the s-rangers.